Experimental study of nanotribology: The sliding friction of journal bearings leads to the development of microcontact points, which induce material wear. I mimic the microcontact induced wear mechanisms by sliding a stiff diamond indenter counter-body of micrometer dimensions across the surface of metals. After single stroke deformation from the right-hand to the left-hand side, white-light confocal microscopy reveal that the local microstructure determines wear induced slip, as shown in the figure. The slip extension is larger for the two lower scratches, while a grain boundary (identified by electron backscatter diffraction (EBSD)) blocks the plastic slip of the top scratch. Depth profile data, before, during and after the experiment is used to evaluate the elastic and plastic contributions. Moreover, the measurements show that the friction coefficient increases with the normal load. Concurrent multiscale model of atomistic and dislocation dynamics: Engineering surfaces have intrinsic notches at which short cracks can initiate and grow. To understand fundamentally short cracks, a multiscale model is warranted which accounts for fracture on the atomistic level, while covering plasticity on a micrometer length scale. The used submodels simulate time-scales, which differ by about three orders of magnitude. 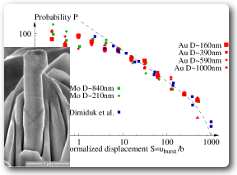 I developed a three-dimensional concurrent multiscale model of Atomistic and Dislocation Dynamics (called AtoDis) and applied it to microscale plasticity around a short penny-shaped notch, which is located at the free surface. 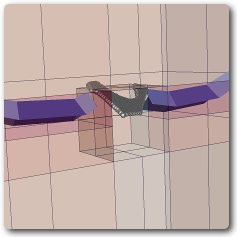 The figure shows the interaction of a dislocation with the penny-shaped crack: the dislocation dynamics simulates the outside domain and a T-shaped dislocation is bowing towards the free surface. Atomistic dynamics mimics the zone-of-interest, where atoms in FCC coordination are filtered out for representation. The remaining atoms are those of the dislocation stacking fault, which move towards the pre-existing notch. Experimental study of powder compaction: The compaction experiments of powders are carried out: load-displacement data of compaction process, measurements of outer die circumference strain and compression experiments on the ejected samples. Powder density distributions are determined by micro X-ray computer tomography, as shown in the figure for two die configurations: conical dies with 30 and 45-degree angle. Please note, only one half of the samples are shown which have a diameter of 12.5mm The density distribution (color distribution) and the residual stress distribution are not homogeneous as shown in the figure. The residual stresses and the cone angles at the top resulted in fracture during the ejection of the compact from the die. Computational studies by another researcher used the Drucker-Prager-Cap model and the numerical and experimental results were compared quantitatively. 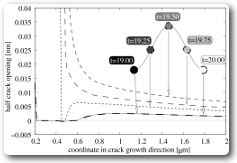 Fatigue crack growth using a strain gradient continuum model: The local deformation mechanisms in the fatigue crack tip vicinity are governed by the presence of plastic strains and their gradients, which lead to statistically stored and geometrically necessary dislocations, respectively. Both dislocation types, in the material scientific view, lead to fatigue crack propagation as well as to crack tip shielding. A cohesive zone model that accounts for fatigue crack tip shielding and anti-shielding, i.e. it incorporates the dislocation induced stress fields in the cohesive zone law. A first-order strain gradient model simulates the plastic deformation. Fatigue crack growth rates for constant amplitude and the overload cases are evaluated and the fatigue crack closure at the crack tip is determined, as shown in the figure for different instances during a load cycle. Experimental study of the deformation behavior of samples of micrometer size: Continued miniaturization for sensing and actuating applications require accurate knowledge of the material parameters at this length scale. At the micrometer length-scale, the surface-to-volume ratio is larger than at the millimeter-scale because the high surface-to-volume ratio restricts plastic domains. I performed pillar compression experiments on gold to study the fundamental behavior of plasticity at these length scales. 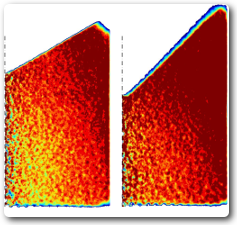 The figures shows a roughly 300nm wide deformed pillar with slip traces on two symmetric slip systems. The graph shows a statistic evaluation of the slip data: large slip events occur less often than smaller slip events. Lately, I, together with Jenna Heyer, Janine Pfetzing and Gunther Eggeler (all Materials Science Department, RUB, Germany), perform novel shear experiments on specific glide planes, which allow to restrict plasticity onto parallel planes without superposed normal stresses. Numerical simulation of ductile failure at the macroscale: Most of today’s components are on the macroscale; hence engineers require verified tools to study failure at this length scale. Macroscopic ductile fracture was simulated for decades using a multitude of tools. However, a critical evaluation of the applicability was seldom performed. I perform blind simulations: first predict the component failure using a numerical tool and then the experiments were executed to verify the simulation tools. This blind simulation is critical for evaluation of a simulation tool because it prevents the use of fitting parameters. This project was part of the Sandia Fracture Challenge, which included roughly 15 teams, mostly from the US. My bachelor student and I were the only team from Europe. To this end, we used conventional tension and fracture toughness experiment data to extract the material properties. This data was used afterwards to predict the failure of a differently shaped specimen. Although, we were the smallest team, we out-performed most of the other teams and correctly predicted the failure load. The investigation showed that an accurate macroscale material description and geometry is required to obtain prediction errors of less than 10%. 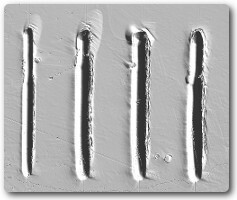 Micrometer-scale methods: For the experimental studies on the micrometer-scale I prepared the complex-shaped samples by Focused Ion Beam (FIB) etching. Post-deformation studies used the scanning electron microscopes. In the case of tribology research, electron backscatter diffraction (EBSD) was employed to obtain the crystal orientation and distribution. Sample preparation used conventional grinding, polishing and in some cases electro-chemical etching to obtain the required surface roughness. Post-deformation studies also included atom-force microscopy (AFM) and in most cases white-light confocal microscopy to reveal surface roughness, that were too severe for AFM measurements. Millimeter-scale methods: During my stay at Purdue, most of the experiments used samples on the millimeter-scale. These samples were tested in MTS hydraulic testing rigs. In most cases, I build custom setups, for example to measure the circumference strain on a thin die during powder compaction. After sample extraction, I performed disc and compression tests. I studied the density distribution of some samples using computer tomography. In other studies, I build a double cantilever beam (DCB) specimen holder inside a wet environment to investigate the stress-corrosion induced crack propagation in-situ under a light microscope. Advanced data processing: Experiments yield significant data. I use my numerical skill to implement data processing routines for almost all my projects. Initially, I used the Matlab package to filter artifacts out of computer tomography data. Nowadays, I use the python language for all my data processing: whether to read AFM and confocal data, to obtain the best-fit scratch width, or to use the time-dependent data and obtain average values and gradients. In some cases, Fourier transforms are used to determine material characteristic wave-lengths. A also use the python language to automatize processes and automatically determine material properties. 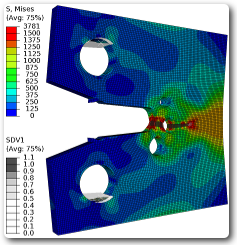 Finite Element Method: I use a variety of Finite Element Method (FEM) software, to investigate stress distributions and crack propagation. During a class, master students of mine wrote independently a C#-based FEM code to calculate the stress at a crack tip, as shown on the lower left-hand corner. I use the Abaqus software and write user element, material and variable definitions in most of my scientific studies. In some studies, I couple the different subroutines to study the diffusion in cracks under stress-corrosion loading conditions. For some large-scale FEM simulations, I use a hierarchical-mesh library to obtain efficient FEM meshes. For Abaqus studies, I have written a C++ tool to generate modified boundary element meshes for multiple configurations. Multiscale Methods: Most of my numerical experience is in the realm of the application of Discrete Dislocation Dynamics in 2D and 3D to study fatigue and. I coupled Discrete Dislocation Dynamics and Molecular Dynamics in 2D and 3D to establish a model that bridges three-orders of magnitude in length-scale and time-scale. I used Molecular Dynamics to study the interaction of a few dislocations and the initiation of cracks. By filtering atoms according to their neighborhood, the Burger's vector of the dislocations was revealed. I used the Density Functional Theory to study the traction-separation curves, which can be applied in cohesive zone models of the FEM framework. Coding languages: I learned programming at the age of 10 or 11 - even before I learned English. My scientific programming started with Fortran 77 because most scientific codes and research groups use that language. A few years ago, I moved to writing in C++ because of its numerical efficiency and speed. I especially valued its advanced data types, which allow to write readable and fault-free code. For projects that leverage external libraries, I use the python language, since it has the most libraries and allows easy graphical user interface creation. Across all computer language, I enforce on my projects and those of my students that the codes must be extremely well documented, commented and formatted. This persistence allows me to understand and improve a given code even after years of not using it. The Netherlands: I executed my PhD studies initially at the Mechanical Engineering Department at the University of Delft. After my PhD advisor moved to the Applied Physics Department of the University of Groningen, I followed him there to finish my degree. During my four and a half years in the Netherlands, I studied Dutch and taught entry-level mechanics courses for physics students in their native language. The United States: After my PhD, I went to Mechanical Engineering Department of the Purdue University for my first post-doctoral studies. Afterwards, I worked at the California Institute of Technology at the Materials Science Department. Even after my return to Germany, I continued collaboration with Boise State University to study Magnetic Shape Memory Alloys. In a second collaboration, I studied ductile fracture in a project with Sandia National Labs. Germany: In Germany, I initially worked for the Interdisciplinary Centre for Advanced Materials Simulation at the Ruhr-University Bochum. Afterwards, I moved to the Department of Structure and Nano-/Micromechanics of Materials at the Max-Planck Institute for Ironresearch in Düsseldorf to work on Nanotribology. I conducted the majority of my research in the domain of material science, which is at the junction of mechanical engineering, physics, mathematics and chemistry. However, I executed some projects outside the material science domain because I value the interaction during interdisciplinary research. Biology: I was part of a research project to study how plasma cleaning can be used to disinfect and to clean bacteria. My partners grew the bacteria and exposed the bacteria to the particles and radiation of plasmas. Looking at the bacteria in low vacuum, I saw that the plasma significantly destroys the outer cell shell. If the bacteria feeding solution is not completely removed, one observes beautiful dendrites, as shown on the left side. We published the work in a peer-reviewed journal. Economy: During the European Cultural Capital Ruhr 2010, I was the speaker of the interdisciplinary research group "The economy of urban diversity: Ruhr area - Istanbul", which comprised of scientists from social science, city planning and architecture. We investigated the role of minority groups in both metropolitan areas and conducted a field trip to Istanbul, to investigate the local Greek and Armenian minority.